Despite their undying love for their former Reverend Opapo Oeti, the Congregational Christian Church in Samoa (C.C.C.S) in Falelatai is moving on. They will be looking for a replacement church minister over the next six months. 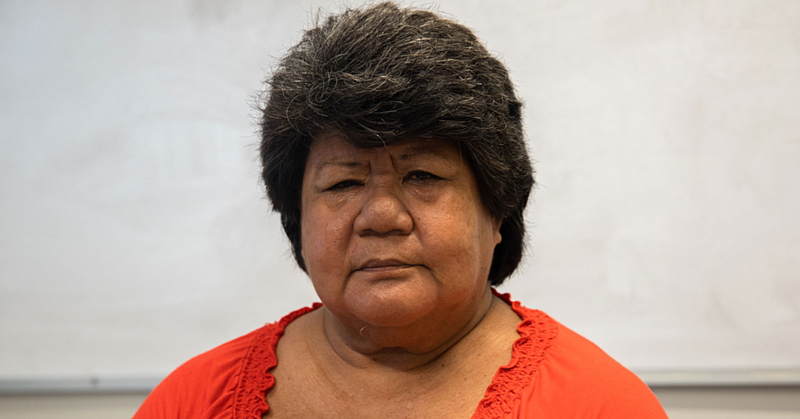 This is according to an official of the church, Fa’alavaau Leaia Molesi who said that it hasn't been easy losing their Reverend who has been with them for 23 years. “There there is nothing we can do as the decision has been made,” he said. Opapo was stripped of his pastoral title last month; a decision taken by the Elders of C.C.C.S. The Reverend is the father of Toaipuapuaga ‘Toa’ Patrick who claims to be carrying the marks or stigmata of Jesus. 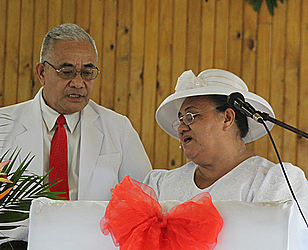 Fa’alavaau told the Samoa Observer minutes after the service, that they are not rushing into looking for another Reverend, but it’s something that will be discussed within the church in the next six months. He made it clear that the church members are heartbroken with the loss of their Reverend, nonetheless they will honour the decision by the Elders. He confirmed that not many members of the church attended yesterday’s service as they were busy ‘cooking’ lunch for their last meal with Opapo and his family. He dismissed suggestions that the church has split since the stigmata in their Church. During the last service at the Church in which Opapo served for 23 years, he was in tears as he gave his final sermon where he spoke about the importance of faith and not giving up during troubling times. It was an emotional service for those who attended including members of other churches in the village, such as the Catholic church and the Church of the Latter Day Saints. Opapo also reminded the congregation that he would be taking with him, the statute of Jesus and Mary to his residence as they were gifts. Mrs Oeti was given the opportunity to speak and on behalf of her family she thanked the church members for their unwavering support and undying love for them in the past 23 years. She acknowledged how difficult it’s been, but the obstacles did not take away their focus on God who is the pillar of their lives. Following the service, an official of the church reminded Opapo that while his services had been terminated, the vow he made with the church cannot be broken. According to Fa’alavaau they will meet again with Opapo and his family on Tuesday at their farewell meeting. He also pointed out that Opapo met with the Village Council on Saturday and they have sorted their differences and he said it’s good that this feud has been settled prior to Opapo leaving the church and village. “The village has forgiven Opapo and he has forgiven the Village Council, so all is well within the village and with our Reverend,” he said. Easter is a time new beginnings and a 63-year-old mother of two advises bloggers and supporters of the anonymous social media page O Le Palemia (OLP) to stop and turn a new leaf.